Bavarian Cream Mousse for The Casanova Charlotte | Bake This Cake! Wild Blackberry Bavarian Cream Mousse in our blog series on The Casanova Charlotte: A 4-layer Italian Genoese Sponge Cake layered with Wild Blackberry Heirloom Frosting, surrounded by a double-high fence of homemade Ladyfingers that is filled with Wild Blackberry Bavarian Cream, dotted on top with fresh berries, oh, and drizzled with Creme Anglaise (Vanilla Custard Sauce). Way! Our hearts are melting for a vintage dessert with pure seduction factor built into every slice. Introducing…Drum roll please…The Casanova Charlotte, oh yeah! A tribute to the heart and a nod to Giacomo Casanova himself, born on April 2nd 1725 in Venice. From Delilah Marvelle’s interesting blog study about Casanova: “…[Casanova] was a priest…, a librarian, a chemist, a novelist, a military man, con-man, pimp, prisoner, dancer, cook, lottery organizer, lawyer, spy, mathematician, violinist, playwright, police agent, mining consultant, silk manufacturer, spoke several languages (the more he knew, the more he could romance, after all), had seen most of Europe…He was anything but perfect, but he had humor, genius and knew how to listen to a woman.” Read online the 1894 London edition of “The Memoirs of Jacques Casanova de Seingalt 1725-1798” by clicking HERE and the Project Gutenberg collection online HERE. 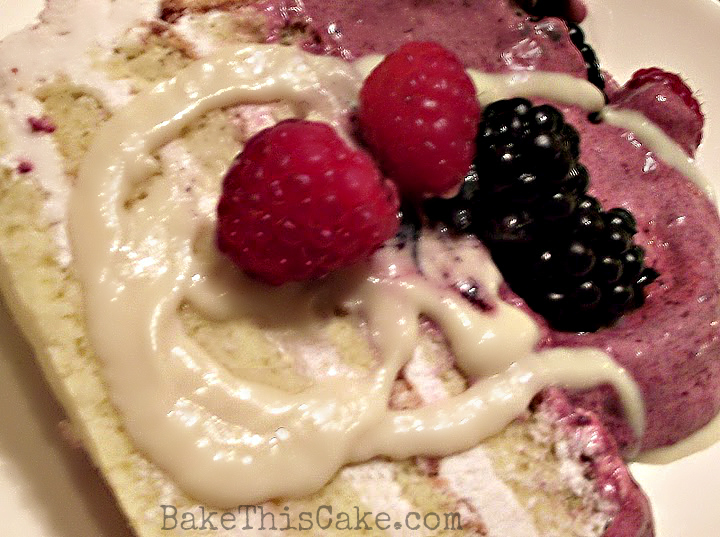 An intriguing historical comeback cake, set up in a series for you to create at home with: the homemade Ladyfingers, the Italian Genoese Sponge Cake, the Wild Blackberry Heirloom Frosting, the Wild Blackberry Bavarian Cream Mousse (seen here for the first time! ), the raspberry & blackberry topping and the Creme Anglaise drizzle…all totaling up to a decadent and fascinating dessert. 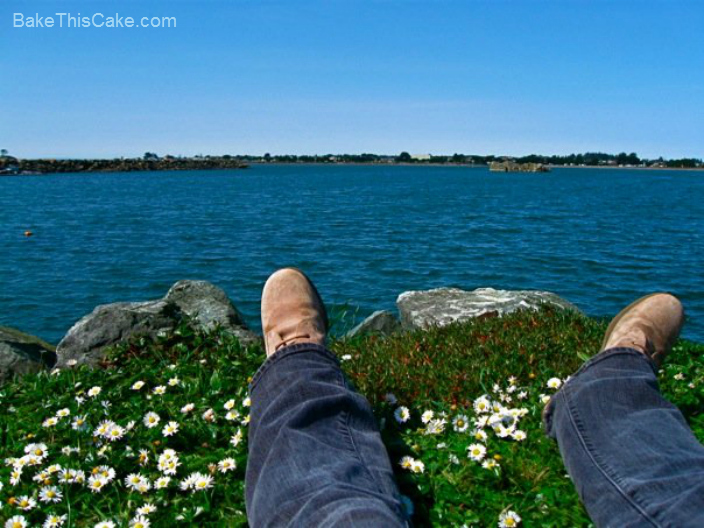 In fact, after you eat a slice, you will dream of romance and little white flowers and pink sunsets. Bavarian Cream aka Creme Bavaroise aka Bavarois may be served “straight up” or ladled within the confines of a wraparound fence of Ladyfingers as we’ve done here…or a thousand other ways. The de-seeded fruit puree is boiled with gelatin, cooled, and whipped together with whipped cream into a lighter-than-thou fruit mousse. 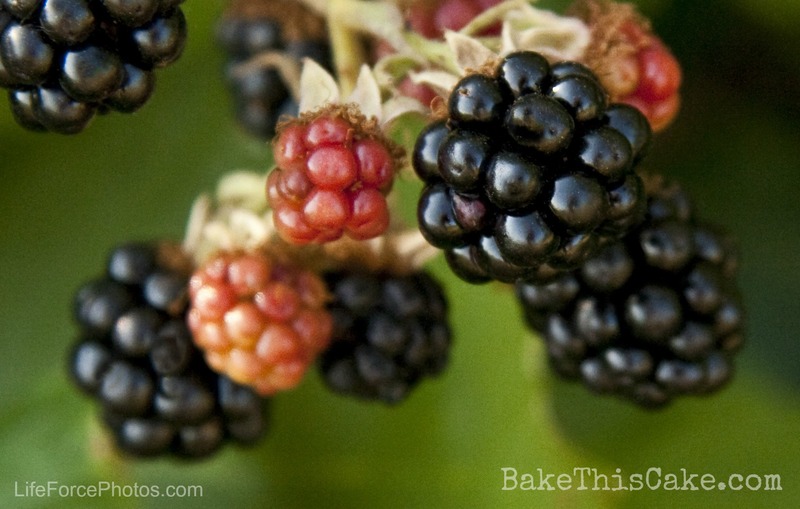 It is made here with wild blackberries to punch it up flavorwise but nearly any fresh local fruit will be remarkable…when you can’t seem to find the time to hike the woods for your own wild berries. 🙂 Hearts will soar when you bring The Casanova Charlotte to your elegant dinner party table. Let’s use our wild little berries and dive into something old-but-new-again and completely intriguing. Shall we? *Ingredients note: I used about 2-1/2 pounds of wild blackberries & 8 ounces of strawberries to achieve 5 cups of pureed fruit (blend of fruit and juice) for the Bavarian Cream but fruit sizes and juiciness will vary. The ultimate goal is 5 cups of fruit & juice. Since de-seeding the fruits takes a bit of patience, pull up a stool, turn on your Pandora and rock it out. Your dutiful labor will result in a wonderfully smooth fruit puree and you will be pleased with the results. Just follow the instructions below set out in step-by-step order. 1.) Wash and drain the fruit you are going to use and pick out any and all little stems or leaves and dot with a paper towel to remove excess water. 5.) Strain out the fruit to prepare it for pureeing (or mashing). 7.) Now PULSE BABY (or mash well with a potato masher or fork). 8.) Choose Your Weapons: Alternate de-seeding tools: Use a Foley Food Mill to spin and grind your way to de-seeding the fruit (although we find that these berries have so many hard seeds, the spinning method is hard to maneuver)…or use a conical strainer to punch the berries through with a wooden spoon. 9.) 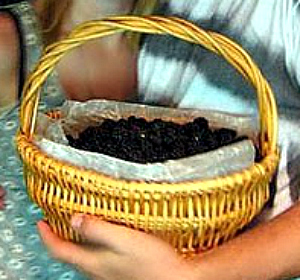 De-seed the wild blackberries and the strawberries by using a wooden spoon to press the fruit through a sieve into the bowl below (just like grape harvest time). Tip: Pour some of the juice you separated into each little batch of sieved fruit to help the berries pass through the sieve.– Ah! This is why we strained the juice from the berries! Tip: This is a slow process so be sure so take a seat and relax while you press, press, press those mashed berries through the metal sieve…and get the music pumpin’. 10.) Measure out the de-seeded fruit to be sure you have 5 cups all total of fruit and juice. e.g. I had a combination of about 1 cup of juice plus 4 cups of pureed blackberries and strawberries. Use only 5 cups juicy fruit puree and set aside any extra for other recipes. Tip: If the gelatin appears hardened or gelatinized, that’s okay because it will melt. The only problem would be if little white “danger lumps” appear after thoroughly whisking with the hot berry puree, which would require straining to remove while the berry mixture is still hot before it starts to gel (because it’s hard to strain white lumps from a thick mixture). 14.) Cool the pot of fruit mixture down by letting it sit off the heat, stirring from time to time, to come to room temperature (about 10 to 15 minutes). 15.) Place the fruit puree in a freezer-proof container in the freezer for 10- to 15-minute intervals, whisking it with each check, repeating until the puree has thickened to the consistency of thick gravy or light pudding. Tip: Consistency is key here because if the puree becomes too hard, it may be hard to smooth out (but not a lost cause). 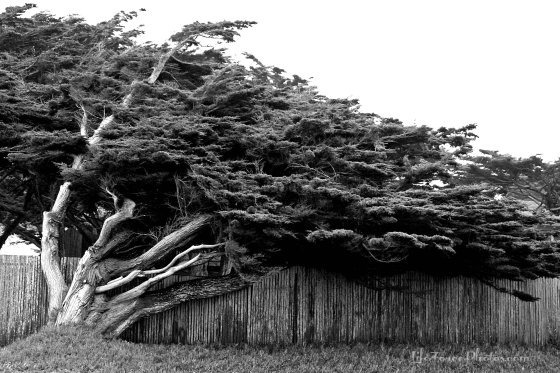 Too thin, it might not gain perfection. 18.) Refrigerate the whipped cream covered (until the berry puree is thoroughly chilled and thickened). 19.) 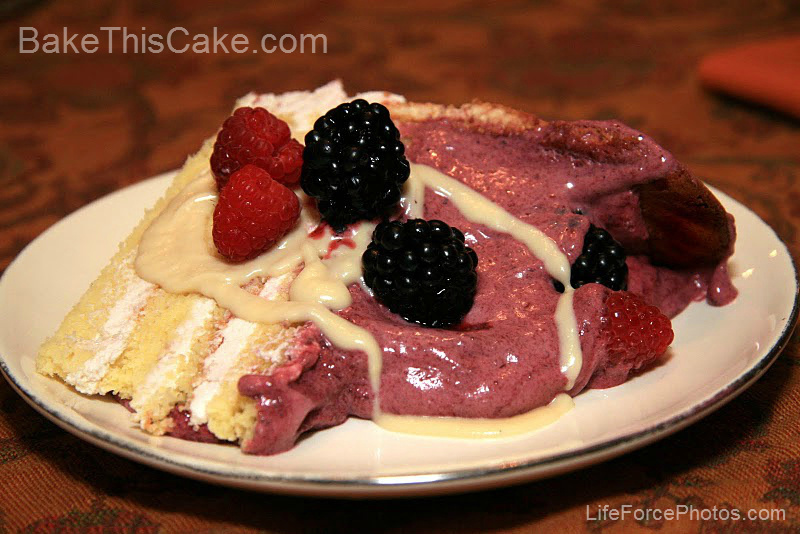 In a large mixing bowl, fold the chilled and thickened berry puree into the chilled whipped cream. 21.) Now chill and WAIT. You will top the cake with the Bavarian Cream when it is chilled in the refrigerator to a sufficient thickness to distribute over the cake within the “walls” of the Ladyfingers without being so runny that it breaks through the cookie cracks. Just chill as it chills for about an hour, checking on it once in a while to make sure it remains a spreadable consistency. 22.) Using a soup spoon (or similar large spoon), gently ladle the thickened mousse on top of the cake, starting in the center of the cake and smoothing the mousse outwards to the outer edges and just touching the Ladyfingers cookies. The goal is not to smooth outward too much or the mousse might seep out between the Ladyfingers. Use the back of a spoon to level the top of the mousse, leaving about an inch of space at the top of the of the cookie “fence” for a layer of fresh fruit to be dotted over the top of the firmed mousse just before serving. 23.) Now cover the entire cake (that’s right the whole enchilada — the Bavarian Cream and the Ladyfingers and the molds and the plate) with plastic wrap or a cake cover and chill 8 hours to overnight. Overnight is best. In the next post (Serving the Charlotte) you will find that just before serving, you will be arranging a lovely decoration of raspberries over the entire top with a rim of blackberries (since too many blackberries with possibly heavy seeds might be too much in terms of seeds for the fruit topping). Your final Casanova Charlotte will look something like this…tah dah! See the next blog post for recipe and instructions on preparing the Creme Anglaise drizzle sauce, traveling with this cake (if needed), topping it with fruit, unmolding it and serving it! I discovered your site on ask and browse pretty much all your other site posts. I just added you to my RSS feeder. Keep up the amazing job. Looking forward to reading more from you in the future.